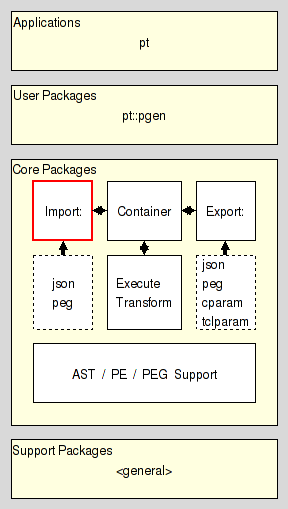 pt::peg::import(n) 1 tcllib "Parser Tools"
objectName method ?arg arg ...? objectName import text text ?format? objectName import file path ?format? objectName import object text object text ?format? objectName import object file object path ?format? This package provides a manager for parsing expression grammars, with each instance handling a set of plugins for the import of them from other formats, i.e. their conversion from, for example peg, container, json, etc. It resides in the Import section of the Core Layer of Parser Tools, and is one of the three pillars the management of parsing expression grammars resides on. For information about the data structure which is the major output of the manager objects provided by this package see the section PEG serialization format. The last three are used only when the package is run on a machine using the Windows(tm) operating system. See PEG Import Plugin. From CONTAINER format for details. See PEG Import Plugin. From JSON format for details. See PEG Import Plugin. From PEG format for details. For readers wishing to write their own import plugin for some format, i.e. plugin writers, reading and understanding the Parser Tools Impport API specification is an absolute necessity, as it documents the interaction between this package and its plugins in detail. This command creates a new import manager object with an associated Tcl command whose name is objectName. This object command is explained in full detail in the sections Object command and Object methods. The object command will be created under the current namespace if the objectName is not fully qualified, and in the specified namespace otherwise. The method method and its arg'uments determine the exact behavior of the command. See section Object methods for the detailed specifications. This method destroys the object it is invoked for. This method takes the text and converts it from the specified format to the canonical serialization of a parsing expression grammar using the import plugin for the format. An error is thrown if no plugin could be found for the format. The serialization generated by the conversion process is returned as the result of this method. If no format is specified the method defaults to text. The specification of what a canonical serialization is can be found in the section PEG serialization format. The plugin has to conform to the interface documented in the Parser Tools Import API specification. This method is a convenient wrapper around the import text method described by the previous item. It reads the contents of the specified file into memory, feeds the result into import text and returns the resulting serialization as its own result. This method is a convenient wrapper around the import text method described by the previous item. It expects that object is an object command supporting a deserialize method expecting the canonical serialization of a parsing expression grammar. It imports the text using import text and then feeds the resulting serialization into the object via deserialize. This method returns the empty string as it result. This method behaves like import object text, except that it reads the text to convert from the specified file instead of being given it as argument. This method returns a list containing the currently specified paths to use to search for include files when processing input. The order of paths in the list corresponds to the order in which they are used, from first to last, and also corresponds to the order in which they were added to the object. This methods adds the specified path to the list of paths to use to search for include files when processing input. The path is added to the end of the list, causing it to be searched after all previously added paths. The result of the command is the empty string. The method does nothing if the path is already known. This methods removes the specified path from the list of paths to use to search for include files when processing input. The result of the command is the empty string. The method does nothing if the path is not known. This method clears the list of paths to use to search for include files when processing input. The result of the command is the empty string. Here we specify the format used by the Parser Tools to serialize Parsing Expression Grammars as immutable values for transport, comparison, etc. We distinguish between regular and canonical serializations. While a PEG may have more than one regular serialization only exactly one of them will be canonical. The serialization of any PEG is a nested Tcl dictionary. This dictionary holds a single key, pt::grammar::peg, and its value. This value holds the contents of the grammar. The value is a Tcl dictionary whose keys are the names of the nonterminal symbols known to the grammar. Each nonterminal symbol may occur only once. The empty string is not a legal nonterminal symbol. The value is the serialization of the parsing expression describing the symbols sentennial structure, as specified in the section PE serialization format. The value can be one of three values specifying how a parser should handle the semantic value produced by the symbol. The semantic value of the nonterminal symbol is an abstract syntax tree consisting of a single node node for the nonterminal itself, which has the ASTs of the symbol's right hand side as its children. The semantic value of the nonterminal symbol is an abstract syntax tree consisting of a single node node for the nonterminal, without any children. Any ASTs generated by the symbol's right hand side are discarded. The nonterminal has no semantic value. Any ASTs generated by the symbol's right hand side are discarded (as well). The value is the serialization of the start parsing expression of the grammar, as specified in the section PE serialization format. The terminal symbols of the grammar are specified implicitly as the set of all terminal symbols used in the start expression and on the RHS of the grammar rules. The canonical serialization of a grammar has the format as specified in the previous item, and then additionally satisfies the constraints below, which make it unique among all the possible serializations of this grammar. The string representation of the value is the canonical representation of a Tcl dictionary. I.e. it does not contain superfluous whitespace. Here we specify the format used by the Parser Tools to serialize Parsing Expressions as immutable values for transport, comparison, etc. We distinguish between regular and canonical serializations. While a parsing expression may have more than one regular serialization only exactly one of them will be canonical. The string epsilon is an atomic parsing expression. It matches the empty string. The string dot is an atomic parsing expression. It matches any character. The string alnum is an atomic parsing expression. It matches any Unicode alphabet or digit character. This is a custom extension of PEs based on Tcl's builtin command string is. The string alpha is an atomic parsing expression. It matches any Unicode alphabet character. This is a custom extension of PEs based on Tcl's builtin command string is. The string ascii is an atomic parsing expression. It matches any Unicode character below U0080. This is a custom extension of PEs based on Tcl's builtin command string is. The string control is an atomic parsing expression. It matches any Unicode control character. This is a custom extension of PEs based on Tcl's builtin command string is. The string digit is an atomic parsing expression. It matches any Unicode digit character. Note that this includes characters outside of the [0..9] range. This is a custom extension of PEs based on Tcl's builtin command string is. The string graph is an atomic parsing expression. It matches any Unicode printing character, except for space. This is a custom extension of PEs based on Tcl's builtin command string is. The string lower is an atomic parsing expression. It matches any Unicode lower-case alphabet character. This is a custom extension of PEs based on Tcl's builtin command string is. The string print is an atomic parsing expression. It matches any Unicode printing character, including space. This is a custom extension of PEs based on Tcl's builtin command string is. The string punct is an atomic parsing expression. It matches any Unicode punctuation character. This is a custom extension of PEs based on Tcl's builtin command string is. The string space is an atomic parsing expression. It matches any Unicode space character. This is a custom extension of PEs based on Tcl's builtin command string is. The string upper is an atomic parsing expression. It matches any Unicode upper-case alphabet character. This is a custom extension of PEs based on Tcl's builtin command string is. The string wordchar is an atomic parsing expression. It matches any Unicode word character. This is any alphanumeric character (see alnum), and any connector punctuation characters (e.g. underscore). This is a custom extension of PEs based on Tcl's builtin command string is. The string xdigit is an atomic parsing expression. It matches any hexadecimal digit character. This is a custom extension of PEs based on Tcl's builtin command string is. The string ddigit is an atomic parsing expression. It matches any decimal digit character. This is a custom extension of PEs based on Tcl's builtin command regexp. The expression [list t x] is an atomic parsing expression. It matches the terminal string x. The expression [list n A] is an atomic parsing expression. It matches the nonterminal A. For parsing expressions e1, e2, ... the result of [list / e1 e2 ... ] is a parsing expression as well. This is the ordered choice, aka prioritized choice. For parsing expressions e1, e2, ... the result of [list x e1 e2 ... ] is a parsing expression as well. This is the sequence. For a parsing expression e the result of [list * e] is a parsing expression as well. This is the kleene closure, describing zero or more repetitions. For a parsing expression e the result of [list + e] is a parsing expression as well. This is the positive kleene closure, describing one or more repetitions. For a parsing expression e the result of [list & e] is a parsing expression as well. This is the and lookahead predicate. For a parsing expression e the result of [list ! e] is a parsing expression as well. This is the not lookahead predicate. For a parsing expression e the result of [list ? e] is a parsing expression as well. This is the optional input. The canonical serialization of a parsing expression has the format as specified in the previous item, and then additionally satisfies the constraints below, which make it unique among all the possible serializations of this parsing expression. The string representation of the value is the canonical representation of a pure Tcl list. I.e. it does not contain superfluous whitespace. Terminals are not encoded as ranges (where start and end of the range are identical).